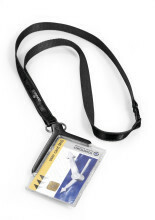 Card holder with black textile necklace for quick and easy fastening of company ID cards, security and visitor passes as well as business cards. Card holder with textile lanyard and slider for 1 card. High transparent plastic quality. Card holder with separate rooms with sliders for 2 cards. High transparent plastic quality. With textile lanyard. Card holder with separate rooms with sliders for 3 cards. High transparent plastic quality. With textile lanyard. 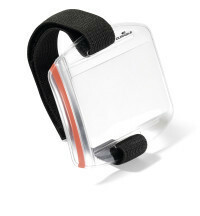 ID card holder with adjustable arm strap for easy identification of people in active working environments.